Can this venting pass thru attic space? Without any enclosure needed? This can pass through attic space but will need a 1" clearance to any combustible material. Can I install this pipe if it is totally enclosed by sheetrock? Will this kit work with a flat roof? No, this kit includes a flashing and vertical termination kit for a standard pitch roof. 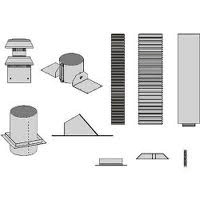 Does this Empire vertical vent kit handle different roof pitches? The flashing in this kit will facilitate installation through a 0/12 to 6/12 pitch roof.